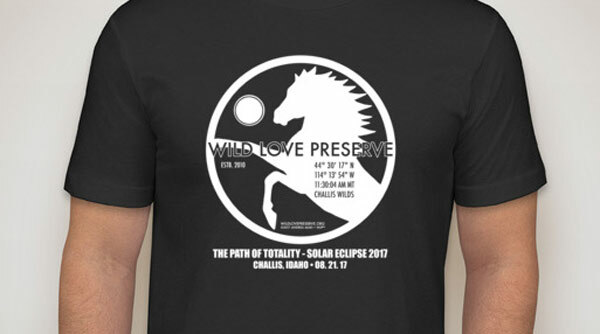 The Wild Love Preserve’s “Path of Totality” commemorative t-shirt, marking the August 21 solar eclipse. The total solar eclipse on August 21 will be visible in totality within a strip across the United States, and it will pass right over the Challis Wild Horses at the Wild Love Preserve in Idaho. Founder Andrea Maki has created a t-shirt to mark the special event, which features the coordinates and time of the solar eclipse in Challis. All profits from the sales of the t-shirts and hoodies support the Challis wild horses on their home turf. The August 2017 eclipse will be the first with a path of totality crossing the Pacific and Atlantic coasts of the US since 1918. Also, its path of totality makes landfall exclusively within the United States, making it the first such eclipse since the country’s independence in 1776. Another equine link is that of the famous British racehorse Eclipse, who was born during a solar eclipse in 1764. The stallion is being featured at the Kentucky Derby Museum in Louisville during the eclipse, and the museum’s Eclipse Viewing Tour will also give spectators a chance to view the eclipse, as well as celebrate the legacy of the great racehorse and sire. The Kentucky Horse Park will also host a solar eclipse viewing party “Park in the Dark”, between 1.30pm and 3pm at Rolex Stadium. The sun in Lexington is going to be 95% covered by the moon, with peak darkness at about 2.30pm. Eclipse, from a painting by George Stubbs. During the event, the eclipse will be broadcast on the scoreboard monitor in Rolex Stadium. The park will also offer half-price admission for the day allowing guests to enjoy all of the normal schedule of demonstrations and shows in the morning, and shuttles will be available to take guests to and from Rolex Stadium for the viewing party. In addition to the day’s planned special activities, the first 250 park guests will be given free eclipse viewing glasses as part of their park admission, beginning at 9am. Map showing the “Path of Totality” across the USA. The longest duration of totality for the August 21 eclipse will be 2 minutes 41.6 seconds at about 37°35′0″N 89°7′0″W in Giant City State Park, just south of Carbondale, Illinois, and the greatest extent (width) will be at 36°58′0″N 87°40′18″W near the village of Cerulean, Kentucky, between Hopkinsville and Princeton. This will be the first total solar eclipse visible from the Southeastern United States since the solar eclipse of March 7, 1970, which was visible only from Florida. Can’t wait to see this. Going to watch it on our local TV channel ABC/WLS. Also, iam keeping my canine family indoors, don’t want to take any chances.